I’m delighted to welcome Anne Stormont back to the blog today. Anne has previously taken part in my blogger spotlight feature (read that here) and I have also reviewed one of her book, Change of Life (read my review here). Today she is sharing #TenThings she’d like her readers to know about her. I was born and grew up as the eldest of five sisters in Edinburgh. I recently moved to the Scottish Borders having lived for many years on the Isle of Skye. I write novels. I’ve written two contemporary, romance-plus novels for adults. The first one published in 2010 was Change of Life and then came Displacement in 2014. I have also written a children’s novel (for 9-12 year-olds) called The Silver Locket published in 2015 using my alter-ego name of Anne McAlpine. I have a loyal and supportive readership although I’m experiencing a certain amount of nagging from them to get the sequel to Displacement I’m surprised by how many adults read and enjoy The Silver Locket. Perhaps it’s because it’s a timeslip fantasy or perhaps it’s because it’s got Bonnie Prince Charlie in it. 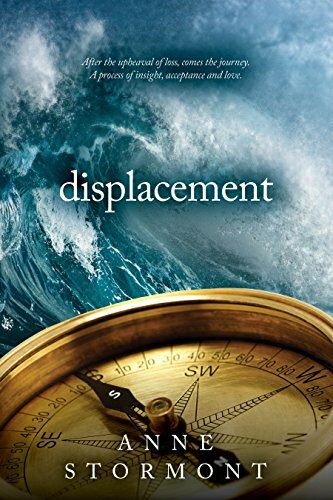 I’m currently working on a new novel entitled Settlement – the aforementioned sequel to Displacement. It will be out later this year. And then I’ll move on to write the third and final instalment of this trilogy which will be called Fulfilment. Like its predecessor, Settlement is set in both Skye and in Israel-Palestine, and I’m often asked about why I chose those particular settings. I was living on Skye when my main character, Rachel popped into my head. She came to me as a Skye crofter, and writer/illustrator of children’s books, whose German Jewish mother escaped Nazi Germany as a child and settled in Scotland and later married Rachel’s father, a Skye man. Following the death of her mother, Rachel decides to explore her Jewish heritage by visiting her brother who emigrated to Israel many years before. I have links with Israel-Palestine myself. I have visited several times and have friends there who are working for peace in this contested country. I also see parallels between the history of the Highland clearances and the enforced removal of the Palestinian people from their homes and land. The dramatic landscape and history of both settings provided a somewhat unusual but wonderful backdrop to the telling of the stories. I was a primary school teacher for 36 years and before taking early retirement in 2014 I had to fit my writing into my spare time when work and family commitments allowed. Nowadays, in theory at least, I have more time to devote to my writing. My typical writing day kicks off mid-morning after I’ve done my daily walk and either a yoga class or my own yoga practice. The remainder of the morning is spent at my desk attending mainly to the social media/marketing/business side of being a writer. Then in the afternoon and early evening I spend 3 to 4 hours writing. My journey to publication was long and slow. I’ve always been a scribbler, but I’m also a procrastinator. For many years I could always find more pressing matters to attend to than writing. Then I got the classic wake-up call which told me we all, me included only have a finite amount of time on this planet. I was diagnosed with ovarian cancer in 1998 aged 42. And I did a deal with fate. I promised that if I survived I’d get on and do the things I kept saying I would get round to one day. One of those things was to take my writing seriously. So after my treatment finished and I got the all clear, I enrolled on a writing course at Moniack Mhor near Inverness. One of the tutors was the writer, Ali Smith. She gave me feedback on a short story I’d written. She said it was okay, but within it there was a novel trying to get out. She urged me to write that novel. I did and Change of Life was the resulting book. After submitting it to several agents and publishers and getting positive and encouraging rejections, I decided, aware as I was of seizing the day, to self-publish. This was just around the time that self or indie-publishing was becoming common and had moved on from the previous, often dubious, vanity publishing model. I assembled a publishing team consisting of an editor, a proofreader, a cover designer and a book designer. I invested in myself as a professional author producing books to a professional standard. I still work with the same team today. When not writing, I enjoy long walks, gardening and listening to music. And of course, I love I enjoy mainly crime fiction and grown-up romance, but I dabble in other genres too and enjoy a lot of non-fiction. I’m currently reading Craftivism by Sarah Corbett. Another thing I enjoy is travel. Me and the husband will be going to Australia in the summer to visit our daughter, son-in-law and grandchildren and I can’t wait. I’ve been fortunate enough to visit every continent apart from Antarctica, and as a huge fan of penguins I really do need to try and get there. The search for resolution after the upheaval of loss. A journey full of insight, forgiveness and love. Forced retirement leaves former Edinburgh policeman, Jack Baxter, needing to find a new direction for his life. Set against the contrasting and dramatic backdrops of the Scottish island of Skye and the contested country of Israel-Palestine, Displacement is a story of life-affirming courage and love where romance and realism meet head-on. Anne’s books are available online and in bookshops and are in paperback and ebook formats. I really enjoyed this ladies. Thank you. Thank you so much for having me on here, Joanne. Thr ten things idea is such a good one and was fun to do. Thanks for taking part Anne. I always enjoy reading the TenThings and they are very popular posts. It’s interesting reading these posts to find how many things we writers have in common! Look forward to Settlement being available, Anne.